Copyright is a form of intellectual property law that protects original works of authorship. This plays a big role in determining who can use music created by you or somebody else as well as how you earn money from your music on and off YouTube. As an Artist, you focus a lot of energy on creating, recording, and performing music for fans to enjoy. Copyright may not be center stage, yet it’s helpful to know about this topic and what it means for you. The sound recording refers to the actual audio recording, whether it’s done in a garage or studio. This copyright could be shared by the performer and the producer or engineer. The musical composition refers to the music and lyrics, which may be written on paper or captured electronically. This copyright could belong to one or more composers and lyricists. Under most record deals, it’s common for the labels to own rights to “master” sound recordings, allowing them to distribute music and collect revenue on behalf of their Artists. In addition, musical composition rights often get assigned to publishing companies, which take on the administrative work and pay songwriters based upon agreed royalty fees. A single musical composition could be associated with multiple sound recordings, if the same song is recorded separately by different Artists (example: “Working Class Hero” written by John Lennon, later recorded by Green Day). Note: The information in this lesson is for educational purposes only and not legal advice. Copyright laws may vary by country. Read about copyright registration with the U.S. Copyright Office. Get more details on copyright laws in other countries. Find answers to your copyright questions with our troubleshooter. Because music copyright can be quite complex, many Artists consult with experts to help guide them. To get started, consider these suggestions. Look at the license. A music license is an agreement that allows the copyright owner to grant certain rights to another party. There are different kinds of licenses, such as for reproducing and distributing songs on LPs or CDs. Other licenses control things such as performing a musical composition in public, or synchronizing a sound recording with an audiovisual work. Be clear on sampling. Some Artists assume they can freely sample another song under the “fair use” principle. However, “fair use” (or “fair dealing”) only applies to certain limited circumstances and isn’t automatic. As a general rule, Artists will need to clear any samples with the copyright owner of the original composition and/or sound recording. Please note that copyright owners may submit a copyright takedown notice to request the removal of unauthorized videos from YouTube. Check out the Library. Creators often want to include some music or sound effects in their videos, without having to negotiate licenses with each copyright owner. The YouTube Audio Library makes it easy to use high-quality audio tracks royalty-free. Let’s say you’re doing a vlog and want to include ambient music in the background or cool sound effects in the intro. Simply search the Audio Library for tracks you like, download, and drop them in. Good news: you can still monetize the video. Note which licenses are needed for sound recordings versus musical compositions. Check if tracks from the YouTube Audio Library require attribution. “Public domain” works aren’t restricted by copyright and don’t require a license to use. Planning to record your own cover? Remember that the original music and lyrics would fall under a composition copyright. The licensing requirements depend on a few factors, including how you distribute the cover, so it’s generally best to get advice from a pro. Share the revenue. Thanks to agreements between YouTube and music publishers, you may be able to share in the revenue from eligible cover song videos on your channel. This is a great way to showcase your talent and make some money! Not all songs or users are eligible for revenue sharing. Hint: Check YouTube’s Music Policies directory for a catalog of songs and their current policies set by the copyright owners. This reveals if the policy would enable ads to appear on cover song videos. Develop a strategy. Keep these points in mind for your covers. Style. Focus on covers that resonate with your favorite genre and highlight your unique talent. Also consider your demographics and how they may be different from the original Artist’s. Timing. Think about releasing covers at a regular cadence, or doing covers for breakout songs. Feel free to experiment and adjust the release of covers and your original songs. Promotion. Use channel features such as cards and playlists to promote covers. Include the title of the original song in your video title and description to boost discovery. Determine which cover songs are eligible for monetization. Myles Erlick and Walk off the Earth deliver their unique version of Adele’s song. 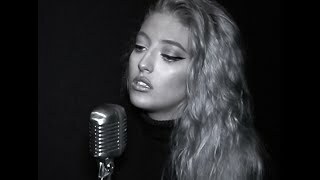 Moroccan/Swedish singer Sofia Karlberg performs her cover of The Weeknd’s single. A lot of people come to YouTube everyday to enjoy music, so we’ve worked hard to build a platform that drives revenue to music creators. Our Content ID technology allows rightsholders to identify and manage their content on YouTube. Music partners—labels, publishers, and other licensors—can automate much of their rights management through Content ID. This includes the option to monetize content through ads and subscriptions, opening new revenue streams for musicians and songwriters. Have you been claimed? In some cases, Artists may see that music videos on their channel have been “claimed” by Content ID. In most instances, a Content ID claim isn’t a bad thing for your YouTube channel; this simply means that the rightsholder (such as the label) has delivered music to the Content ID database so that we know how to handle it. You can see which videos have been claimed in your Videos page in YouTube Studio. If you don’t recognize the claimant, note that it could be a distributor or aggregator that’s working with the rightsholders. You can always check with your label or publisher. Content ID scans videos across YouTube, finding other videos that match the official sound recording or composition. This system allows rightsholders to monetize fan uploads and share the revenue with Artists. One last thing to remember: music rightsholders may not be the same in all territories. YouTube will follow whatever policy the rightsholder specifies per country, including whether to monetize. Copyright strikes are separate from Content ID claims and can impact your account. 99.5% of audio claims are automated through Content ID identifying the content and applying the copyright owner’s preferred action.